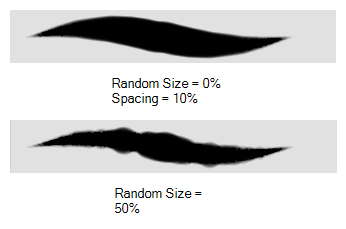 The Eraser tool allows you to erase artwork by drawing eraser strokes over it. 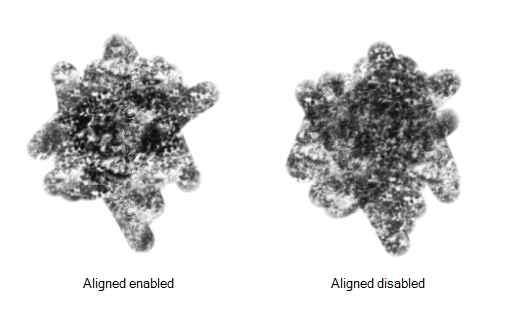 When using the Eraser tool with a tablet, it is pressure sensitive, like with the Brush and Pencil tool. NOTE For tasks related to this tool, see About the Eraser Tool. 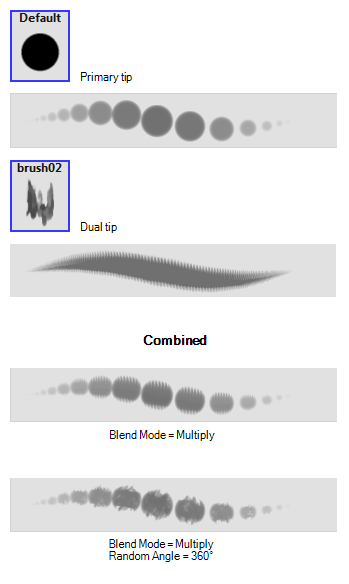 The way the Eraser tool is configured is almost identical to the way the Brush tool is configured. The arrow button right of the display area opens the Eraser Properties dialog, which gives you access to all the parameters and options for your eraser. The Tool Properties view only gives you access to a few of the eraser properties, a list of eraser presets and options for the Eraser tool that are not related to the eraser properties. 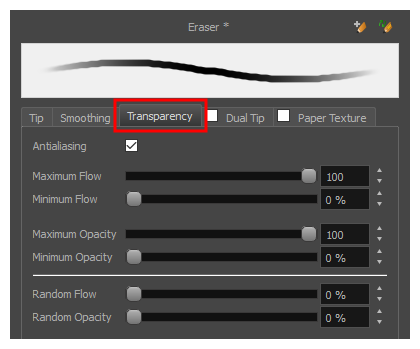 For more information on the Eraser Properties dialog, see the Eraser Properties Dialog section below. 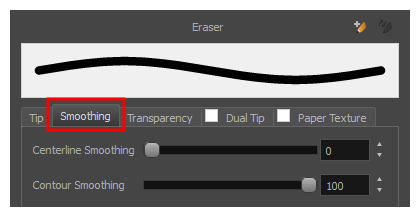 These options allow you to select, create and manage eraser presets. By default, Storyboard Pro has preloaded eraser presets. You can also create your own eraser presets by configuring your eraser, then saving its properties into a new preset. It is also possible to export and import eraser presets. 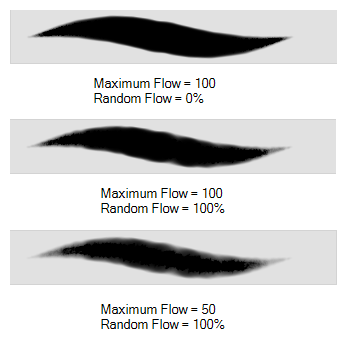 NOTE Textured erasers only work as expected on textured brush strokes. 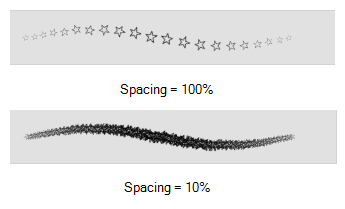 Using a Textured eraser on a solid vector brush stroke or on a pencil line will only cut the eraser stroke's shape out of it. 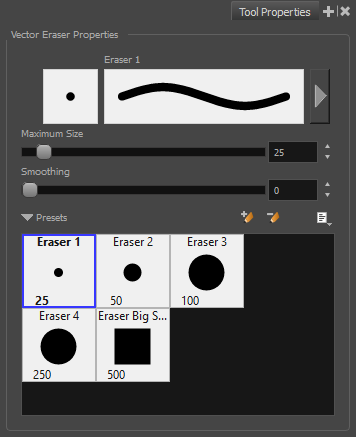 If you use a Textured, Preserve Vector type eraser on a solid vector shape or on a pencil line, the eraser will not erase anything. NOTE This option is not available when working on a bitmap layer. 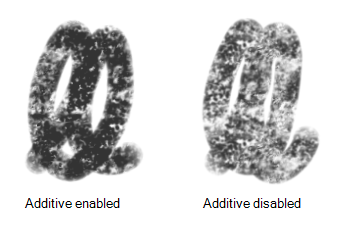 With bitmap layers, erasers are always textured, and textured eraser options are always available. To create a custom eraser tip, you must prepare the file ahead of time, either in Storyboard Pro or in a third-party software, such as Adobe Photoshop. Colour is not supported and transparency is not supported in the traditional sense. Black appears as 100% opaque, white appears as 100% transparent and all the shades of grey in between appear as varying degrees of semitransparency. A range of file formats are supported—.jpeg, .png, .tif, .psd, .tga to name a few. Alpha channels are disregarded on import. It is recommended that your file be between 100 x 100 pixels and 400 x 400 pixels. You can also import eraser tips that you exported from Storyboard Pro, so you can share them with colleagues. The Smoothing tab contains options to configure how Storyboard Pro should automatically smooth your eraser strokes as you paint. 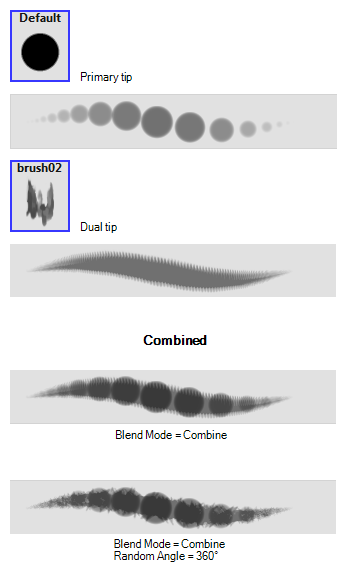 Centerline Smoothing Defines the amount of smoothing Storyboard Pro should perform on your eraser stroke's direction, curves and corners. 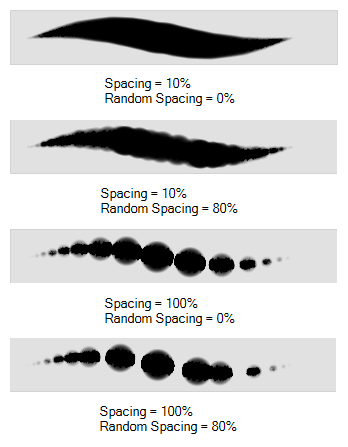 A higher setting will prevent your line from being shaky, but is liable to reduce drawing precision and turn sharp angles into curves. 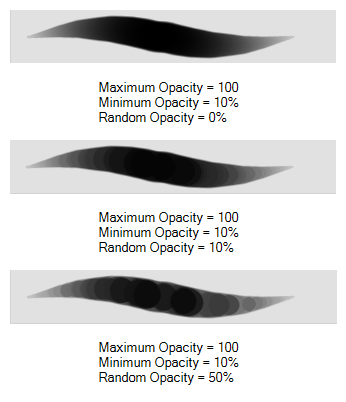 Defines the amount of smoothing Storyboard Pro should perform on outer contour of the eraser stroke. 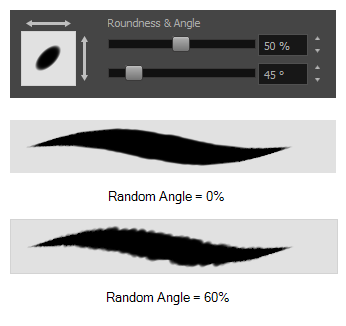 A higher setting will round sharp corners and reduce the amount of control points for the resulting vector shape. NOTE The Transparency tab's options are only available on vector layers if the Eraser Type option of the Tip tab is set to Textured Vector or Textured, Preserve Vector.. On bitmap layers, those options are always available. 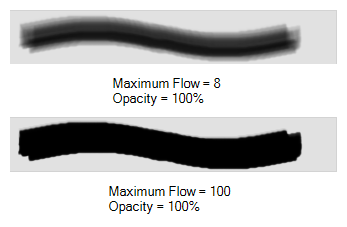 NOTE To use a Dual Tip, you must enable option by checking the checkbox inside the Dual Tip tab. 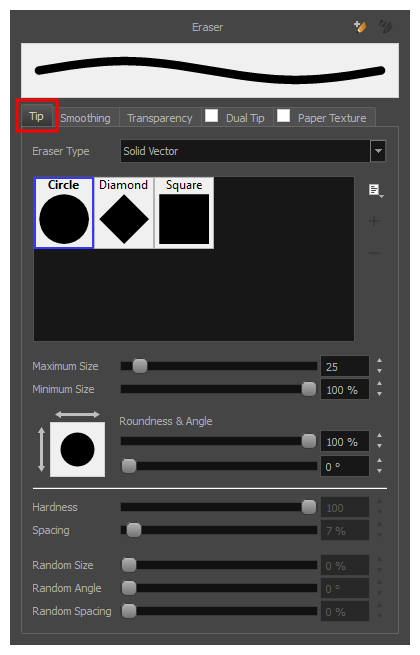 Additionally, if you are working on a vector layer, the Eraser Type option of the Tip tab must be set to Textured Vector or Textured, Preserve Vector. 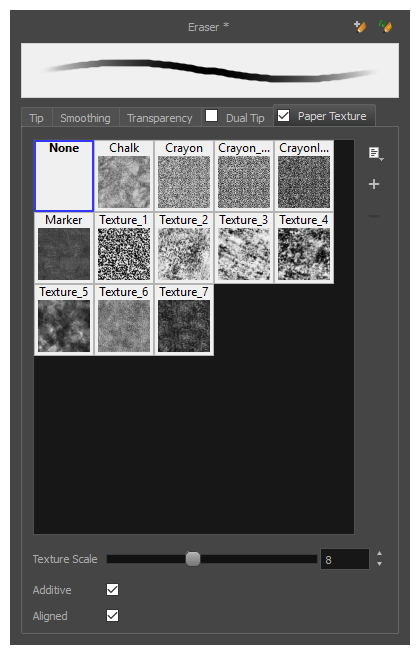 The Paper Texture tab lets you configure a paper-like texture for your eraser. You can also add textures by importing image files, or import paper textures that were previously exported from Storyboard Pro. 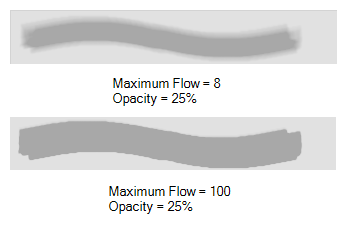 NOTE To use a Paper Texture, you must enable option by checking the checkbox inside the Paper Texture tab. 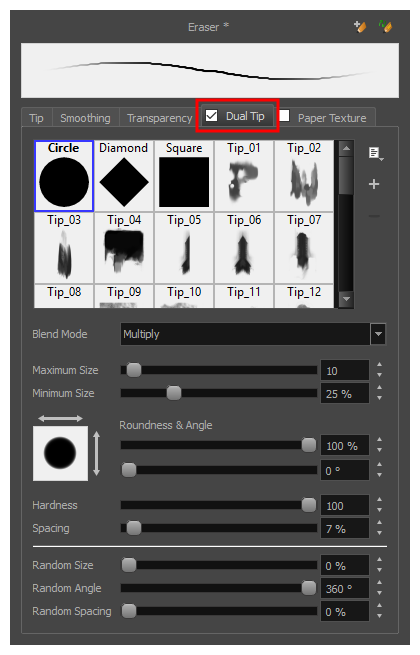 Additionally, if you are working on a vector layer, the Eraser Type option of the Tip tab must be set to Textured Vector or Textured, Preserve Vector.